Price: Normally $12.95 - now on sale for $8.95! The FAST TRACK to editing photographs in Photoshop like a pro! 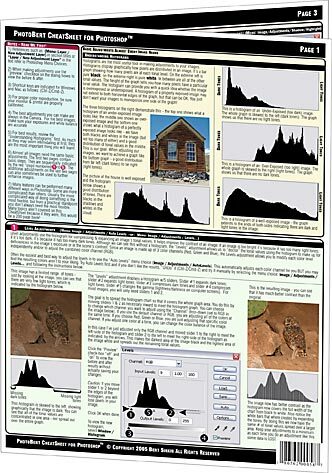 This CheatSheet contains concise information on how to improve your images in PhotoShop Elements. If you've been intimidated by terms like Histograms & Levels, fear no longer! This is for you! This amazing CheatSheet covers the most important aspects of editing Photographic images in Photoshop Elements version 4. While Photoshop Elements contains a HUGE number of features, this CheatSheet concentrates on what a photographer needs most. Once you understand the topics on this CheatSheet, learning the rest of what's in Elements will be much easier.